Okay, I'll admit it: I can't stop eating this salad. I know I'll have to at some point because I'll eventually run out of the ingredients. But right now I am completely and utterly 750% in love with this flavor combo. Now, you regular PGEW readers know that I go through periods of obsession with certain foods, usually with one particular ingredient like cheese, blueberries, etc. This time around it's no different: I am obsessed with all things chocolate, which isn't that far-fetched for a chocoholic like me. Ever since my PFB dinner party last Friday, where I showcased chocolate in all its different incarnations, my obsession has grown astronomically and I now view everything through a chocolate-colored haze. Not in Twix or Kit Kat form, but in all the special, unconventional, non-dessert-or-candy ways that I discovered through my research for that last challenge. It's funny... I consider chocolate to be the unofficial fifth food group and one of my three favorite foods of all time (can you guess the other two? My undying love & devotion, and perhaps even a cookie can be yours if you can), yet it's the one ingredient I haven't really featured on PGEW until now. Why? Who knows? Perhaps because it's so sacred to me that I just eat it in small increments of deep, dark, bittersweet squares and never have enough left over to put into a decent recipe. This particular salad dressing allows me to enjoy that mysterious, bittersweet quality in a way I'd never tried before. As I mentioned in my For the Love of Chocolate post, the dark chocolate used in the dressing enhanced the complex qualities in a way I never expected. Not too sweet and not too savory, it tasted like history, like long walks down old cobblestoned Italian roads in the middle of the night. Different; enigmatic; delectable and decadent. Lest I get too carried away with how dark chocolate and this particular dressing make me feel, let's come back to the recipe at hand. Because this dressing is so.... intense, it's important not to use too much on one's salad. I've ever been a fan of bathing my greens in thick globs of dressing anyway; I'm more of a "dipper" or "drizzler", and use my dressing to enhance the flavors & textures of the greens and other salad ingredients I'm enjoying. But this is not the kind of dressing that is actually the star of the show, and less is definitely more in this situation. For the actual salad, I used an herb salad mix from TJ's, which features plenty of dill, cilantro and other fun little herbs in addition to the traditional spring mix (and costs just $1.99). If you can't find something similar in your regular grocery stores, don't fret! A regular spring mix or even baby spinach will do the trick nicely. No iceberg or romaine! This dressing is for the good greens, the ones with more flavor and nutritional value than water content. I also used some spiced pecans from a recipe my mom makes (I'll have to get that from her and post it later), but regular pecans would work just as well. Because pecans are usually on the pricey side, chop 'em up! They'll last longer that way. As far as the cheese goes, any decent goat cheese will work great, but if you can get thyself to a Trader Joe's, get the honey-chevre!!! I almost did backflips in the store when I saw this goat cheese perfection was back (apparently it's a seasonal thing..... seasonal as in, every other fall for 2.5 seconds. Grrr...), and it lent just the right amount of creamy sweetness to balance out the rest of the bold flavors. Prepare the dressing by combining the chocolate and balsamic vinaigrette in a small saucepan. Cook over very low heat for about 3 minutes, or until the chocolate has completely melted and the vinegar has reduced. Remove from heat and transfer to a medium bowl. Add the oil and whisk until completely combined. Season with salt and pepper and whisk to combine. Assemble the salads by arranging equal portions of greens on medium salad plates. 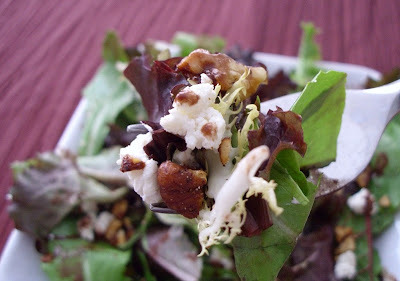 Sprinkle with chopped pecans, then add the crumbled goat cheese. 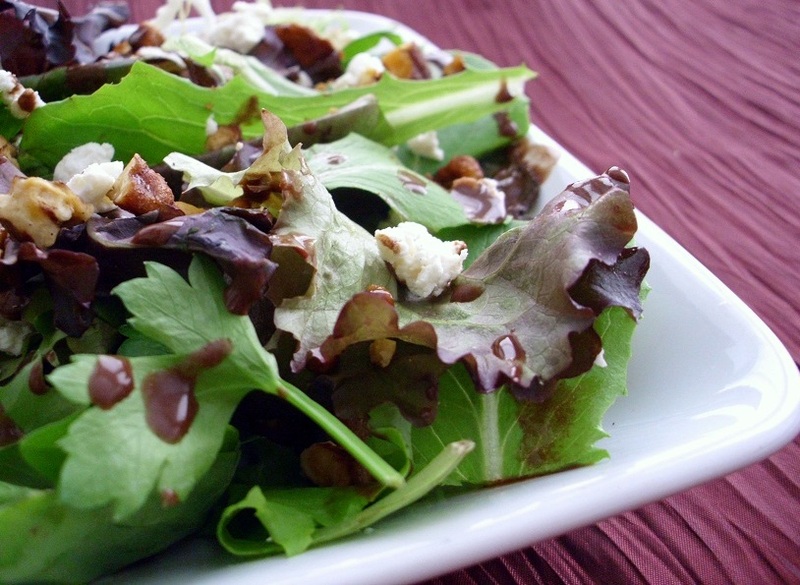 Lightly drizzle each salad with dressing (about 1-1 1/2 teaspoons per plate; try not to overdress! ), top with more freshly ground pepper if desired, and enjoy! NOTE: You can store the remainder of the dressing in a glass jar in the fridge. If it happens to thicken up a bit when cooled, simply thin it out with a small amount of water. Mmmmmm, that sounds amazing! And really easy, too. I think I'll have to pick up the ingredients tomorrow. I think I still have some extreme dark chocolate (88% pure cocoa) at work - would that work, maybe with a pinch of sugar so it's not too bitter? Also, dumb question, but you say in your post that it's three ounces of chocolate, but the recipe itself calls for one. Which is correct? Oh, so it's just the average of the two. Not bad! I do have the chocolate, and it's actually 90% (I thought it was a different brand, which does 88%), so good to know. Thanks! goat cheese, chocolate, and balsamic vinegar?!?! i can't wait to try this out!!! I just made this, and ZOMG it was good!! I ended up nuking the chocolate and balsamic vinegar, since I don't have a small saucepan. I didn't really taste the chocolate (I did have the right kind) : ( , but I threw in toasted pecans and "Drunken" goat cheese (from Spain soaked in red wine) which I am in love with!